Click here to search our comprehensive database of dementia resources. Find any resource that is published on this website, in more than 40 languages, including Help Sheets, toolkits, guides, videos, websites, apps, brochures, infographics. Our dementia Help Sheets provide advice, common sense approaches and practical strategies on a wide range of subjects. These Help Sheets are available in more than 30 languages. Our Help Sheets are PDF files which you can read in your browser, or save to your computer to read later. You can also print them out, or you can have them read aloud by the website. Browse our new Video Library where we showcase videos on a wide range of subjects. Listen to children speaking frankly about what it is like having a parent or grandparent with dementia. See our community language section to find video collections available in wide range of languages. Watch videos on homelessness and dementia, Lewy Body disease, risk reduction, planning ahead, and more. Find resources translated into more than 40 languages including Arabic, Armenian, Assyrian, Bengali, Cantonese, Croatian, Dari, Dinka, Dutch, Finnish, French, German, Greek, Hazaragi, Hindi, Hungarian, Indonesian, Italian, Japanese, Khmer, Korean, Lao, Latvian, Lithuanian, Macedonian, Maltese, Mandarin, Polish, Portuguese, Punjabi, Romanian, Russian, Serbian, Somali, Spanish, Swahili, Tagalog, Tamil, Thai, Turkish, Ukrainian, Urdu and Vietnamese. Find useful help sheets, videos, KICA, Walkabout Memories, risk reduction and learning strategies. Read more about resources for Aboriginal and Torres Strait Islander peoples here. Find videos and information for LGBTI people with dementia. Our help sheets provide a range of useful information, specifically addressing the needs of people diagnosed with younger onset dementia and their families and carers. You will find fact sheets, videos, other various resources and a collection of very personal stories containing insights into living with younger onset dementia. Lewy body disease is a common neurodegenerative disease of ageing. This means that the disease causes gradual brain damage. In this section, you will find a series of help sheets, fact sheets, stories, video resources and information specially developed to assist your understanding of Lewy body disease and the disorders that arise from it. Find dementia resources for people from culturally and linguistically diverse backgrounds.. These resource have been developed to guide and promote best practice standards of care that address cultural diversity across all levels of service design and delivery. A collection of websites providing information about dementia and related topics. 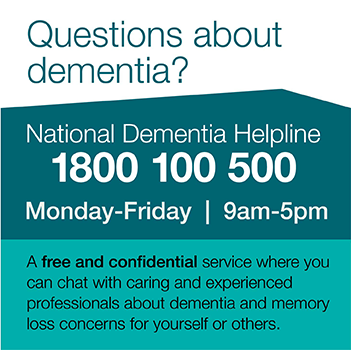 Dementia Australia has a large range of information resources which are available online. Some of our most useful and popular resources are also available in print.